Koprivnica is a very pleasant town of 24,000 inhabitants in northern Croatia just a few miles from the border with Hungary and was always a border town linking the Hapsburg and Ottoman Empires. 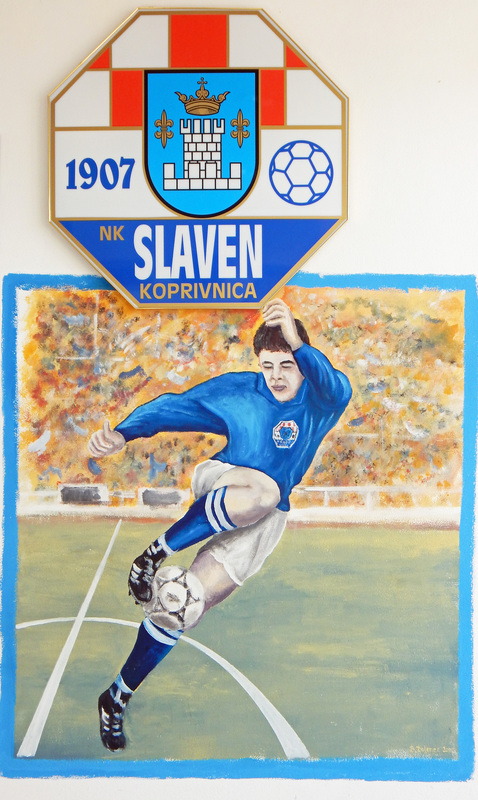 Senior football came to the town when the name of HŠK Slaven was adopted by the Freidrich family in August 1912 as direct replacement for NK Đački, a students’ team formed in 1907. Đački had an inauspicious start losing their first ever game 15-1 to HAŠK Zagreb. Despite winning the Croatian regional championship in 1920 HŠK Slaven, having been renamed HŠK Victorija, folded only six years later. Reforming in 1930 the club has undergone numerous name changes including HŠK Koprivnica, HŠK Danica, RNHŠK Sloga, FD Slaven and SD Podravka. 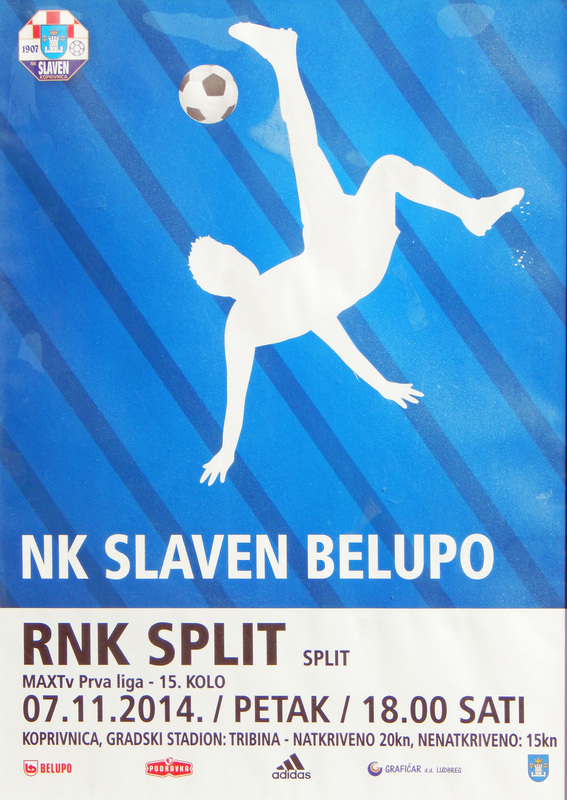 The club became NK Slaven Koprivnica in 1958 and the only chances since have been the addition of a sponsors name, this currently being Belupo, a local pharmaceutical company. Since the break up of the Yugoslavian League system the top tiers of the resultant national leagues feature a few big names but also a number of relatively small clubs. 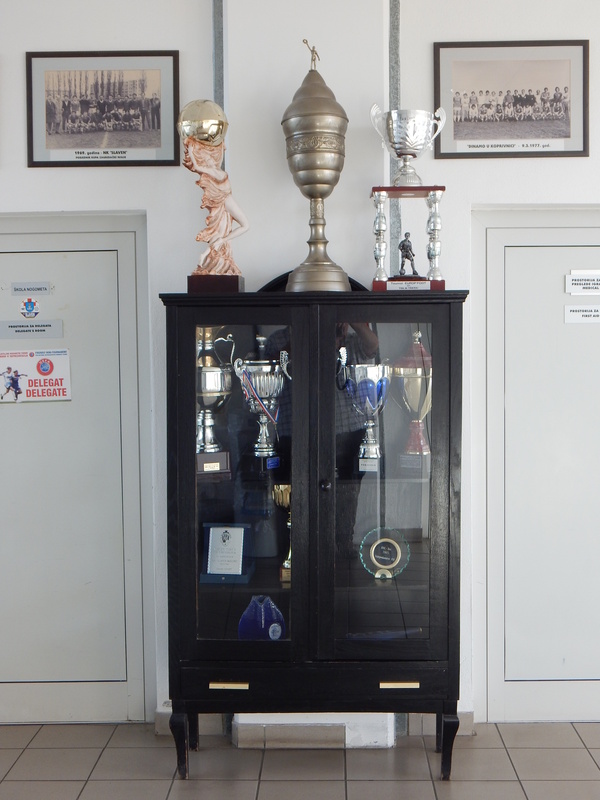 It is still something of a surprise that this modest provincial club have been in the Croatian Prva Liga since 1997 having won the northern section of the regionalised second tier Druga Liga. 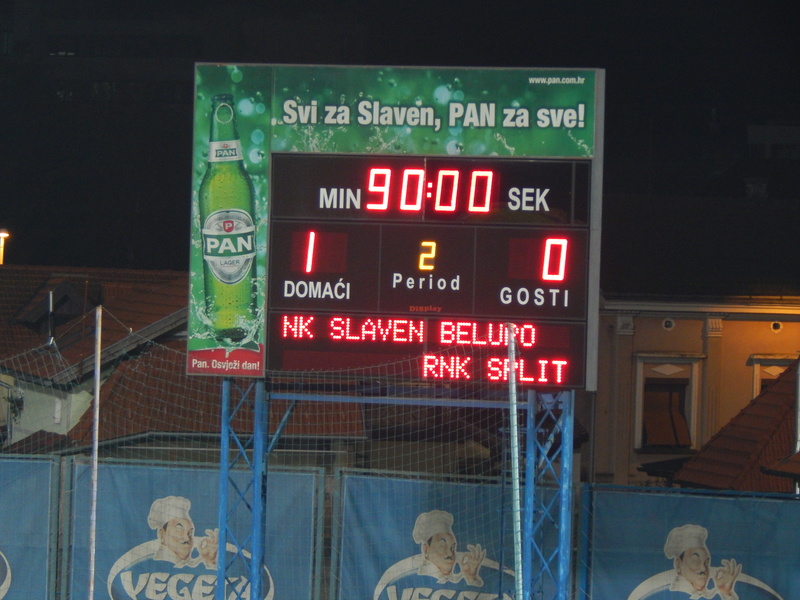 Since their elevation to the top flight Slaven have been a predominantly mid table side although in 2007/08 achieved a runners-up spot in the Prva Liga, although they were actually 28 points behind perennial champions Dinamo Zagreb. The club were in the Europa League qualifiers as recently as 2012/13, defeating Portadown before bowing out to Athletic Bilbao. 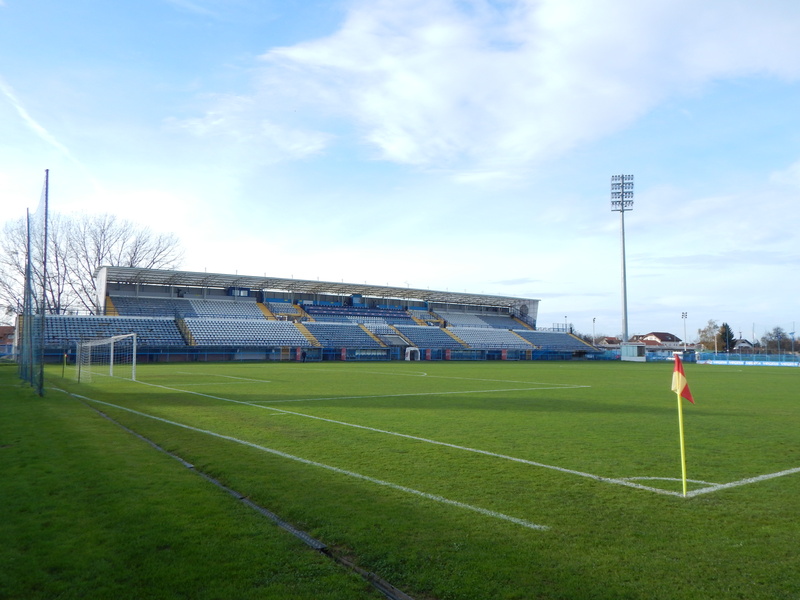 Slaven play at the Gradski Stadion u Koprivnici which has one large stand, with 3,134 seats, built in 1997. 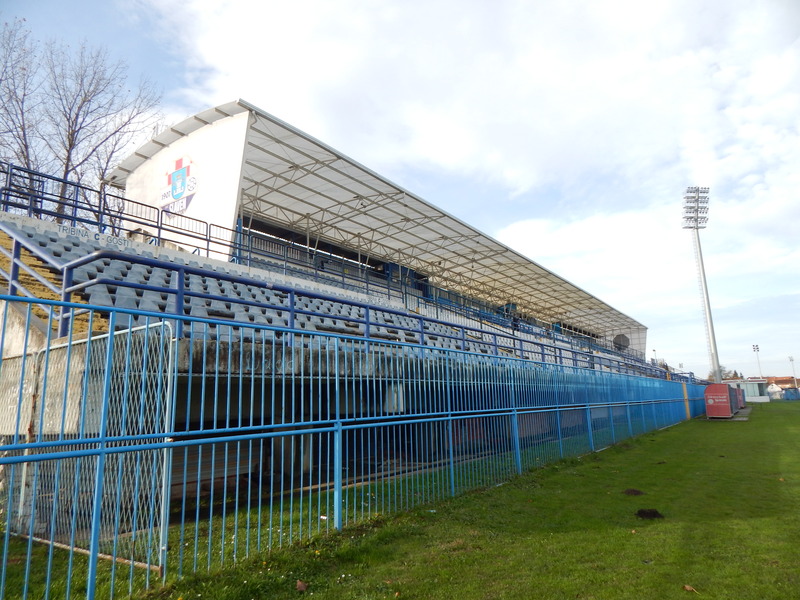 For a Croatian under 21 match against Scotland in 2000 the centre of the rear section of seats was covered with a roof, this being extended to cover the rest of the top tier of seating as recently as 2011. The bottom tier remains open to the elements and the rest of the ground has no further spectator accommodation. 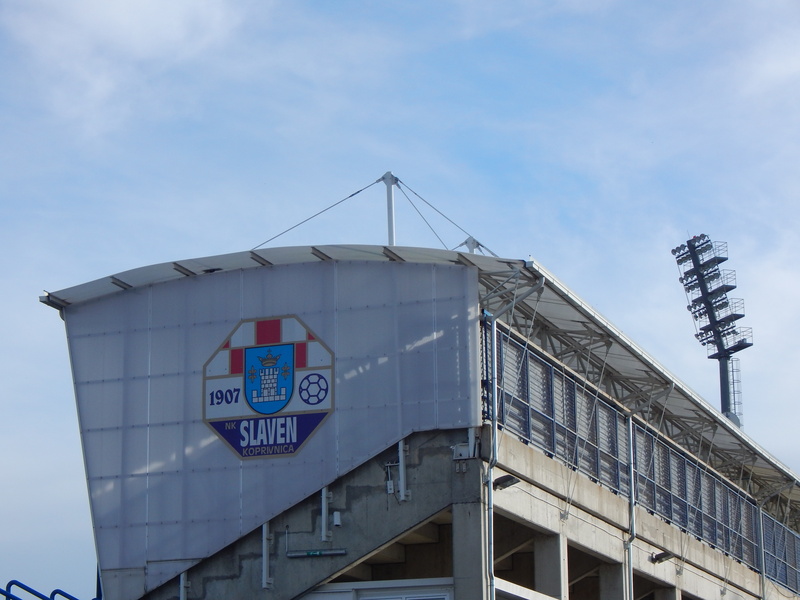 The Gradski has only had floodlights since May 2007, erected in order to host Europa League matches. Slaven qualified for the Europa League having been runners up to Dinamo Zagreb in the two legged Croatian Cup final. Last season Slaven finished next to bottom in the ten team Prva Liga, and only stayed up by virtue of a 4-3 aggregate play-off win over Cibalia. This season has also been a struggle for “The Farmaceuti” (The Pharmacists) and tonight’s game, covered live on television, sees the hosts in bottom spot with just ten points from the opening fourteen rounds of matches. It is interesting to note that on the bench for Slaven is 39 year old striker Davor Vugrinec, a career veteran with lengthy playing experience in Italy and Turkey. Tonight’s guests are Radnički Nogometni Klub Split, the workers club from the southern city of Split. They themselves have a really interesting history having being founded by anarchists, playing under the name HRŠD Anarch and sporting an all black kit. 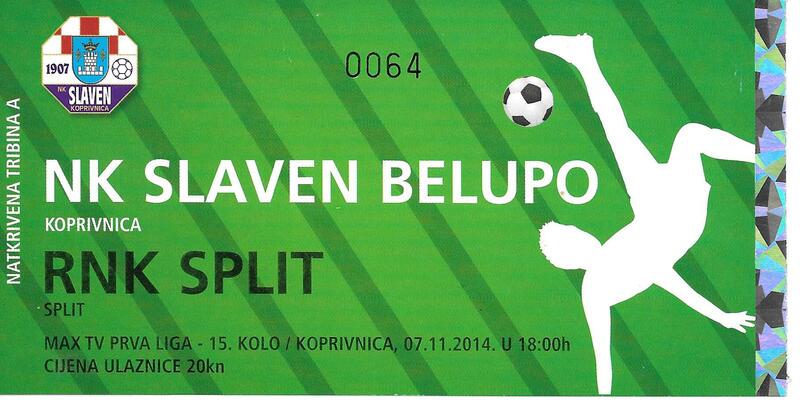 Nowadays they sport all red attire and currently hold a mid table position in the Prva Liga. Tickets for this top flight match range between £1.50 and £2. The first half of the match is very low on quality both teams content on passing the ball to each other and mainly heading backwards towards their own goal. The home crowd (officially quoted as 2,000 although in my eyes 500 was a more realistic figure) soon start venting their frustration, a grey haired man bedecked in Slaven attire, bellows gutturally between puffs of an omnipresent cigarette. The second half is marginally better and notably the home side try to go on the offensive. It was a lucky ricochet off a Split defender that led to the goal. Attacking left back Dario Melnjak seized the loose ball and scored with a shot into the corner of the net. It was a rare piece of quality in a dour match and saw Slaven move off the bottom of the table. 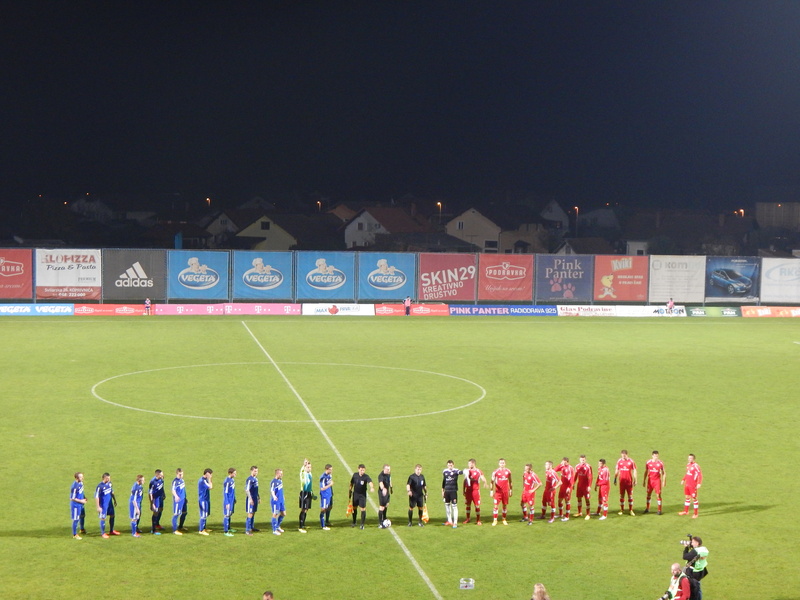 Despite the low quality of the football it was nice to experience an everyday game in a little known province of Eastern Europe. I, for one, hope they manage to stay up this season. 1. Ivan Kardum, 3. Dario Melnjak, 4. Mato Grgić ©, 6. Ljuban Crepulja, 8. Daniel Cesarec, 9. Dominik Glavina, 10. Petar Brlek, 11. Goran Paracki, 14. Mateas Delić, 18. Ivan Fuštar, 23. Stjepan Geng. Subs: 12. Dominik Picak, 7. Ivan Vasilj, 13. Petar Filipović (for 14,90 mins), 15. Davor Vugrinec (for 8,80 mins), 19. Marko Mirić (for 9,79 mins), 22. Enes Novinić, 26. Hrvoje Plazanić. 12. Danijel Zagorac ©, 3. Denis Glavina, 4. Ante Majstorović, 6. Tomislav Glumac, 14. Goran Roce, 17. Marko Rog, 24. Miloš Vidović, 25. Dario Rugašević, 26. Nino Galović, 29. Ivan Ibriks, 99. Sokol Cikalleshi. Subs: 1. Tomislav Duka, 5. Branko Vrgoč, 13. Josip Uzelac, 16. Tomislav Radotić, 18. Luka Grubišić, 32. Marko Roglić, 35. Ivan Jukić (for 4,67 mins). 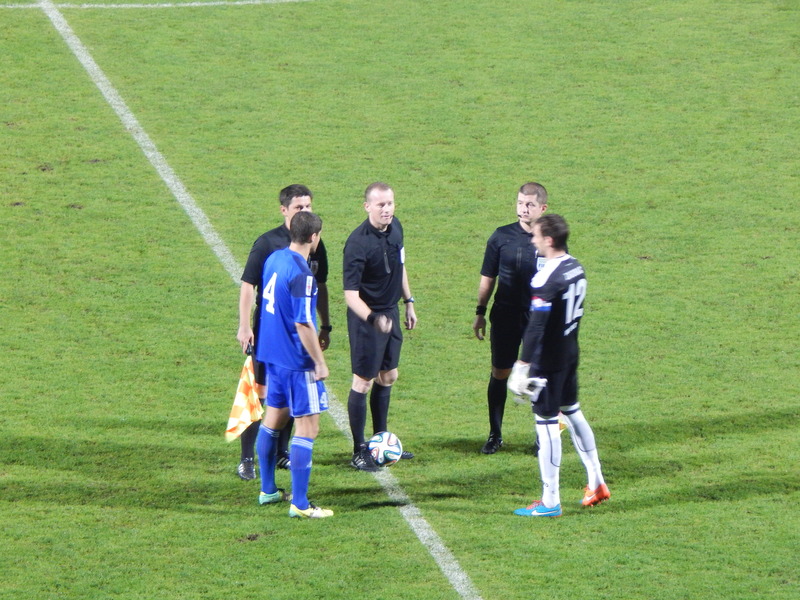 Yellow Cards: Melnjak, Glavina, Brlek, Paracki (all Slaven); Glavina, Majstorovic (both Split).